Much of what happens in the entertainment business is like this because many are narcissistic, self-centered and looking for their own career gains. Many will chew you up and spit you out if it moves their agenda up the charts. If you were friends with someone who makes it to the top, your friendship will end if you are not at the top of the heap as well… you just don’t bother with someone who has nothing to offer in your career rising … the narcissism rises faster than the career. There are exceptions but they are few. Michael Nesmith was not a rich kid at the time he was cast in The Monkees. He was a young father with barely enough gas to get to his gigs and the audition. His mother’s invention of Liquid Paper was not profitable until 1968 – LOOK IT UP BEFORE YOU PRINT STUFF LIKE THIS! The Monkees were cast in November 1965. The Monkees had six more Top 40 hits after Kirshner was dismissed in March 1967 and two multi-platinum albums, not only one big one as you state. If Kirshner had let The Monkees play on their B-sides and album tracks, he would have never lost his job. Those are the pure facts. Davy always sided with Kirshner, he was happy with how Donnie picked the songs. Please don’t exploit his death with half-truths – I felt tricked. Thank you! In retrospect I think Don Kirshner was a smart businessman and although Micky grew to be a great drummer and Mike and Peter being musicians already they were young when they were mad at Kirshner. I am assuming that Mickey and Davy understood the business and were not as upset as Peter and Mike since they were musicians. I can understand their frustration especially at that age. However I must say that in retrospect Nesmith is probably the only one who may hold a grudge I have heard Peter state that being older and wiser he sees that Kirshner did them a favor. Nesmith is so far removed from the Monkees I doubt he even thinks about Donnie Kirshner anymore. Its too bad someone has not done a tribute to Mr Kirshner because when he come out with Rock Concert it was one of the best things on TV! The Monkees being offered “Sugar, Sugar” was just a piece of Monkees folklore, It was not copyrighted until 1969, and it was not published by Screen Gems-Columbia music, which The Monkees could only record songs published by Screen Gems-Columbia. Just like Charles Manson didn’t answer the Monkees ad, as he was sitting in jail at the time, according to Vincent Bugliosi. This book on Don Kirshner seems to have half-truths in it, which makes me reluctant to want to buy it. Artie, I’ve read the preceding comments here and wanted to add mine. Growing up, I was actually a 1960s era classmate of the son of the 3rd employee of Liquid Paper, Mr. Walter Bibby, who helped to take the company to the next level with his business acumen. Online sources indicate it was in 1956 when Mrs. Nesmith, a young divorced mother, was working as a bank secretary, and out of sheer frustration with the need to retype entire documents if one error was present, began producing and selling her first batch of LP, after having developed it at home and used it in her bank offices for a few years as she worked to perfect the formula (God bless Mrs. Nesmith, later Mrs. Graham, as I was learning to type in 1962 and hated the eraser mess myself). From 1956-1966 the company’s growth began skyrocketing as secretaries around Texas initially were snapping that product up like hotcakes before going bigtime. The point being that the company enjoyed sufficient success to be considered vastly profitable prior to the date that Mr. Sandoval indicates it became profitable. However, in defense of what Mr. Sandoval says, and more to the point, the most important point is never to define Mr. Nesmith as a rich kid. Because no matter what assets may or may not have been of access to him at any point, as a strictly outside observer with a modicum of knowledge, he never once traded on any identity or assets other than strictly his own talent and ability. You have to applaud that as a young man wanting to make it on his own. I can confirm, from speaking personally with Carl Giammarese, about their days as struggling musicians early in the early 70s, after the heyday of The Buckinghams and The Monkees had found them disbanded–as the singer/songwriter period was beginning, Mike Nesmith was there in the same coffee houses as Giammarese and his singing partner were; ‘big names’ starting over again, passing the hat in small clubs, while playing their own music for audiences, redefining themselves after being pop idols. In my opinion, for what it’s worth, Mike, Davy, Micky, and Peter all became famous thanks to the Kirshner hit factory of writers and his selection of specific music that helped shape the soundtrack of a generation, an undeniable foundation of the success of The Monkees. Davy Jones himself mentioned that (and I have it on tape) during his Jan. 27th concert I saw personally during the Concerts at Sea Cruise week. Davy joked (paraphrasing), I always wondered why Michael Nesmith was driving a Cadillac and I was driving a Volkswagen…and then I learned his songs were the B-sides of our hits.” Folks laughted. He continued, joking about the disparity in profits the TV and music rights generated for everyone else except him, “Our TV show was on in, I think, 36 countries, and we did 56 episodes, and I’m still waiting for the check.” Continuing, “It isn’t about money at the end of the day, is it? It’s about meeting new people and having a wonderful time.” And then Davy broke into one of his signature tunes, “Mary, Mary.” (quotes from my own online story). Mr. Sandoval is the definitive authority on The Monkees, but in defense of Mr. Podolsky and the book, it is possible that he simply took Mr. Kirshner’s quote about the “no more big hits after he was gone” and ran with it, rather than consider disputing the person he looked up to as a major hero of the music business being blusterous and one-sided in his view on that point. The Monkees would, however, be one of the few groups collectively who didn’t put Kirshner on a pedestal because so many of the great songwriters certainly do, to read Podolsky’s book of interviews with people who rarely give interviews, but since it was about Kirshner, they were willing to talk. I’ve read Mr. Podolsky’s book, this past weekend in fact, and found it to be an exciting and fast paced recounting of the life, career and times of Don Kirshner, a man beloved by every songwriter from the Brill Building days whose own words share how they could never repay his generosity toward them as struggling songwriters. Songwriter after songwriter recounts what Kirshner did for them, that no one saw, to help them out of financial binds from everything from mortgage payments, to parents’ funerals, to engagement rings, ad infinitum, because that’s the kind of guy he was. In response to “Markieo’s” comment, author Podolsky does indeed identify the legend of “Sugar, Sugar” as exactly that–legend. I’ll quote: “Over the years it’s possible that Kirshner embellished one part of the story of his volatile meeting with the Monkees. He has often noted that he brought a special record to that meeting…and according to Kirshner, the Monkees wanted no part of any song Kirshner selected for them and turned it down…There’s reason to question if Kirshner actually had “Sugar Sugar” written for the Monkees. If the Monkees turned down the song in January, ’67, then why did it take him more than two and a half years to release it, in July ’69? could he have decided to archive a great song that long just to get back at them?”…so that statement should be offered in defense of Mr. Podolsky who questioned the veracity of Kirshner’s memory or claims..
Mr. Sandoval is a superior biographer of The Monkees, and Mr. Podolsky is a superior biographer of Don Kirshner.. in Podolsky’s book,.there’s more fabulous details on Bobby Darin, Connie Francis, Carole King, Gerry Goffin, Cynthia Weil, Barry Mann, et al. In the topic of “didn’t get much of nothing,” it’s a darned shame that the talented singing artists, Toni Wine and Ron Dante, didn’t receive royalties for lending their gifted vocals to the hits of The Archies. They ‘are’ the Archies, and for years no one had a clue and more importantly, Miss Wine wound up with “a dozen roses” as her “reward.” Mr. Dante fared better by producing Barry Manilow. Most poignant are the words of Tony Orlando who clearly loved Kirshner like a father. In closing of my lengthy diatribe, few people outside those directly involved in the business have a clue as to how the music of a generation really came to be. Most of your friends and commenters, Artie, are all ‘somebody’ in the entertainment business. But for the rest of us, as we are all now (gently) aging Baby Boomers, we are so hungry for details of the lives of the people whose works of music we cherished and stories of those loved by teenagers everywhere (such as Davy) that we are hungry for any details which become more urgent and immediate upon the announced loss of someone important in our lives. No one could have known that the scheduled release date (set months ago) for the Kirshner book would occur as it did, in the same week, so the fact that Chapter 26 (of 28 Chapters) entitled “Sugar, Sugar” covers Don Kirshner’s relationship with The Monkees and waits that long to get there, gives those who haven’t read it a better idea of the book’s real emphasis, on Aldon Music, on publishing hit after hit and in fact, Artie, giving you your very first break, thanks to Bobby Darin, in your songwriting and music producing career. I know that because….I’ve read your book. Thanks for reading. “Donny was totally dedicated to the musical success of the Monkees. He turned the office upside down searching for songs and musical producers that would propel them to greater heights. Every single piece of material was screened in order to find a winner among them, suitable to put the group on the charts. what we all could muster to bring it on home. The rest is history. I think there is a bit of overreach here in suggesting the song writers were the real stars and that somehow the artists who offer these performances are just along for the ride. There’s a certain bias to what “counts” and what doesn’t in the creation of a song and therein lies the skew by which people take sides in this issue. There are so many factors that have to line up to make a song sell, it doesn’t just end with the song writer. Ask Bernie Taupin about that opinion with Elton John. Ask Fankie Valli if Barry Gibb would have had more success with Grease instead of him. Better yet ask Kenny Rogers and Dolly Parton who sang one of Barry Gibb’s songs. Are they invalid because they didn’t write and compose the song? Of course not. 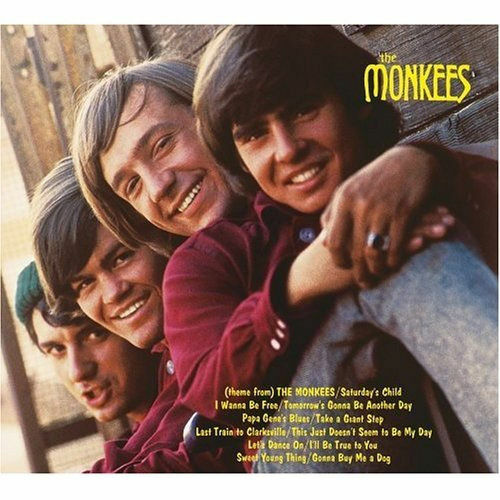 The Monkee’s vocals were on those early hits and for me, that is as much a part of the song’s appeal as the music. Seeing them visually is another aspect of what sold those songs as well. Music is not just made in a vacuum and anyone who performs it or sings it will have similar results. That is a complete myth. The truth is everyone involved were needed to make the Monkees in the beginning…including the Monkees. The band believed enough in themselves to break away from that support structure and make a hit record without them. Three million records is quite the achievement for Headquarters. So to say that just one person somehow deserves all the credit is short-sided as can be imagined. It took everyone involved to get the Monkees started and from there it became so much more than anyone envisioned. How that can be diluted into something bad or deemed as something of less pursuit remains confusing to me. How can anyone think the Monkees have not earned their place in musical history with all the influences they’ve brought to the craft is not even worthy of a discussion. Having great song writers in house to make hits is a staple part of the process then as it is now. That’s often where it starts, but it’s never where it ends. The Monkees are legitimate and always have been. « MIKE MELVOIN R.I.P. ROCK IN PERPETUITY!